I have two design walls in my sewing room. I have the Orca Bay Mystery up on my larger wall today and nothing on the smaller wall. 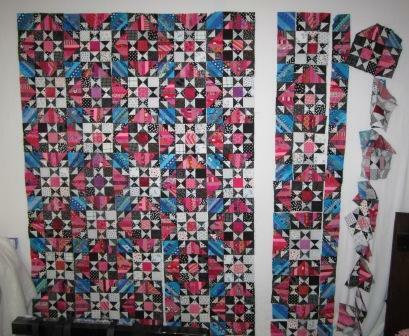 I have been sewing my rows together and just have a little left to do and then I will be on to the boarders. I am being very careful on the row sewing and trying to not lose any points. I find that I want to be fresh and not do this type of sewing at the end of the day. So I feel a little slow this week. I have also gotten back to work quilting and did some cleaning in my room on Sunday. I did not want to do clean for the new year but it is just time to clean part of my room. I am sure no one will ever guess I did do some cleaning, as it is so packed it will still be a mess. Lots more cleaning to be done. I should have done a before and after photo. I already have most of a three foot high stack on the orange table sorted and put away, but still need to find the orange surface. I may need to buy a few bins and start a pile for give away. Mostly magazines need hauling out. The box with the boarder pieces still in it. This box was used to hold all my pieces as each step can out. Check out the other work on Design Wall Monday over at Patchwork Times Today. Your Orca Bay looks wonderful, Cathy! My design wall is wider than it is tall, so I've been hanging my sewn pieces that way -- to the point where it's all covered now. Once I finish with the next row, I think I'll turn the piece and have it hanging vertically, as you've done, to have room to continue using the design wall. Your mystery blocks are looking really good! Great job getting so much done. I love your colors in this mystery quilt...the 3D effect is really coming out! Beautiful! 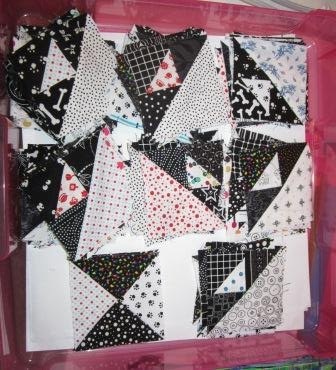 Your quilt is looking great, I agree it does take time to put these rows together. I just started yesterday, not nearly as far along as you. It is fun seeing it all come together. This is my first mystery quilt not to mention the most pieces I have ever put in a quilt. Your Orca Bay looks great! I had a little trouble with the border not fitting so be sure the 2" inner border is going to be the right measurement for you. I need to do some sewing room cleaning myself--but I have too many projects out and covering all the flat surfaces--LOL! Happy Quilting! It is great looking. I had started some but now have just printed as I don't have the fabric here. When I get home. Your OB is really coming along nicely! I hope when I start to put mine together that I don't have too much trouble.